A point-in-time restore uses commitlog archives to restore data from a particular date and time using OpsCenter. Restore data from a previously completed backup run from OpsCenter. Monitor disk space for backups and restores using dashboard widgets and alerts. Observe the Current Data Size of backups and the Storage Capacity dashboard widget to anticipate disk space requirements. Take advantage of the Capacity Service to anticipate capacity based on disk usage or other metrics. Add a free or used disk space alert to send notifications when disk space becomes compromised. For a point-in-time restore, OpsCenter intelligently chooses which snapshots and commitlogs to restore from based on the date and time you are restoring the cluster to. If an acceptable combination of snapshots and commitlogs cannot be found, the restore will fail and a detailed error message is visible in the Activity section of the OpsCenter UI. For point-in-time restores to work, you must have enabled commitlog backups and performed at least one snapshot backup before the time to which you are restoring. The Restore feature of the Backup Service leverages the sstableloader utility, which currently requires enabling the thrift server on all nodes before restoring. Before restoring, ensure the thrift server is enabled on all nodes. When performing a point-in-time restore, the cluster topology must not have changed since the backup. Attempting to perform a point-in-time restore on a cluster whose topology has changed results in a failure. 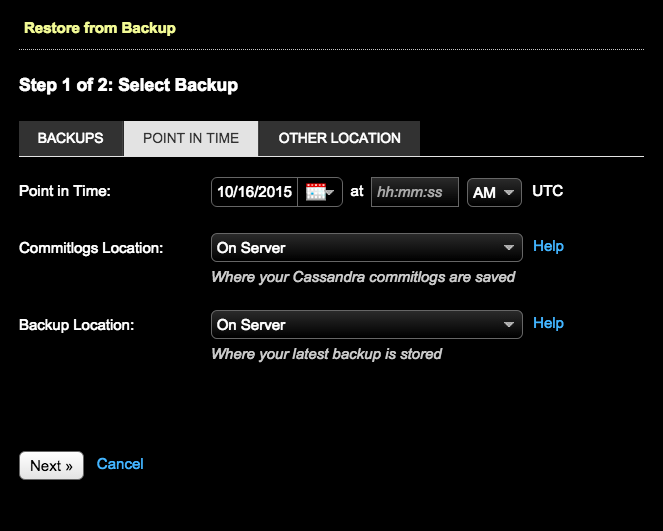 DataStax recommends performing a snapshot backup before changing cluster topology. You can then restore the cluster based on that backup. Point-in-time restore cannot restore commitlogs for keyspaces or tables that would have to be recreated in Cassandra 2.1 and later, and DataStax Enterprise 4.7 and later. Point-in-time restore fails if any tables were recreated during the time period of the actual point-in-time restore. Click the Configure link for the Backup Service. The Restore from Backup, Step 1 of 2: Select Backup dialog appears. Click the Point In Time tab. Point in Time: Set the date and time to which you want to restore your data. Commitlogs Location: Select the location of the commitlogs, either On Server or another location on S3. The location of commitlogs is configured when enabling commitlog backups. Backup Location: Select the location of the snapshot, either On Server or another location on S3. The backup location was specified when creating the backup. The Restore from Backup, Step 2 of 2: Configure and Restore dialog appears. Keyspaces: Select the tables included in the backup you want to restore. Click the keyspace name to include all the tables in the keyspace. Click All Keyspaces to restore all the keyspaces. Location: Select the target cluster for the restored data. The Location list is only available when both clusters are managed by the same instance of OpsCenter. If you select a different cluster than the one that was backed up, the data will be cloned to the selected cluster. Restoring encrypted tables to a different cluster will not work unless the encryption keys are identical, which is typically not the case. Click the Edit Restart Settings link to adjust settings for the rolling restart. OpsCenter retrieves the backup data and sends the data to the nodes in the cluster. A snapshot restore is completed first, following the same process as a normal snapshot restore. After the snapshot restore successfully completes, OpsCenter instructs all agents in parallel to download the necessary commitlogs, followed by a rolling commitlog replay across the cluster. Each node is configured for replay and restarted after the previous one finishes successfully.